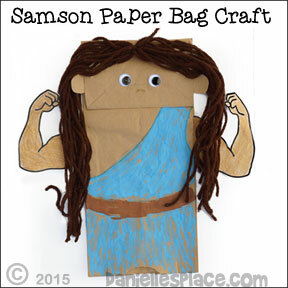 The following ideas about Samson come from the Sunday School lesson "How Strong are You?". The Complete Lesson with printable patterns are available to members on The Resource Room for $23.95 per year and as an instant download. 2. In class have your children color the arm patterns and glue them to the side of the bag. 3. Wind yarn around a book about five times and then pull it off and tie it together in the center. Cut the ends. Have your children glue or tape the hair to the puppet. 4. To finish have them draw on clothes and wiggle eyes. 1. 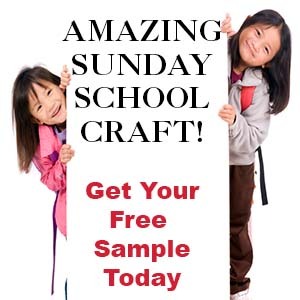 Before class glue the jumbo craft stick and the extra jumbo craft stick together in the shape of a cross. 3. In class have your children cut six inch lengths of yarn and tie them together in the middle with another piece of yarn, and then glue it to the head of the puppet to make the hair. 4. Give your children the clothes patterns and have them cut the pattern from the material or paper towels. If you have younger children pre-cut the clothes and just have them decorate it with markers. 5. Show your children how to lip the clothes pattern over the craft stick, gather it at the waist and then tie it with a piece of yarn. 6. Make columns out of paper towel tubes and loosely connect them at the top with another paper towel tube that has been folded into a rectangle shape. 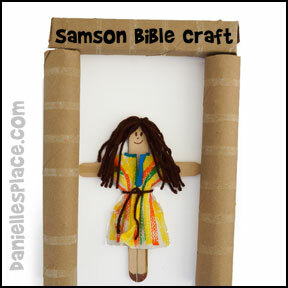 Have your children use the columns to act out the story of Samson when he knocked over the building. 1. 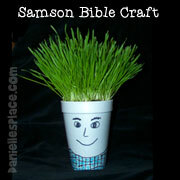 Have your children draw a face on one side of the cup and write the Bible verse on the other, and then fill the cup with dirt. 2. Have them sprinkle grass seed on top and water. Place a piece of plaster wrap over the top and secure with a rubber band. 3. Tell them watch Samson's hair start to grow in a few days. 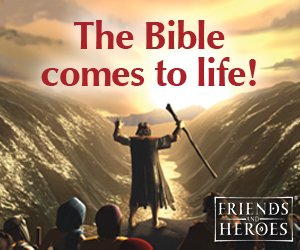 This book teaches children that God not only gives us physical strength, but can give us strength to do what is right. Children color the pictures in the book and then draw arrows on the "weak to very strong" gage on the right side of the paper in the appropriate area depending on how strong or weak they feel they are at doing the specific task on that page. You will need empty aluminum soda pop cans. Show your children an empty pop can, place it on the floor, and put your foot on it and balance your weight over it while holding onto the back of a chair. Let your children step on it and try to balance their weight on it also. Comment on how strong the can is. 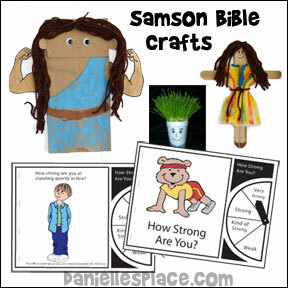 You will find even more activities relating to Samson on The Resource Room, above.